Above: In this picture is a nice Freshwater Red Crayfish, crawling across the bottom of one of our aquariums, when one of us snapped this picture. Comments: These are Crayfish that we rarely see in the live fish stores or in the online fish stores that we visit. Premium crayfish like these Crayfish are more hardy and more colorful than Crayfish from other sources. Origin: This Lobster's ancestors lived in northern Mexico and the southern United States, but it is now an invasive species in many parts of the word, and also lives in many aquariums all over the world. Maximum Size: In aquariums, this Crayfish often grows to be about 5" long, but they live many years and continue to grow slowly for their entire lives. Behaviors: They usually stay at the bottom of the tank, and have quite a personality. Compatibility: Some recommended tank mates include any community fish, some small fish may be easy for these lobsters to get their claws on, so watch out. Click hereto read more about compatible groups of inverts. Temperature: This Crayfish can live pretty well from about 70 to 80 degrees F., but they're probably most comfortable from about 75 to 78 degrees F. Click here to learn about aquarium temperature, aquarium thermometers, and aquarium heaters. 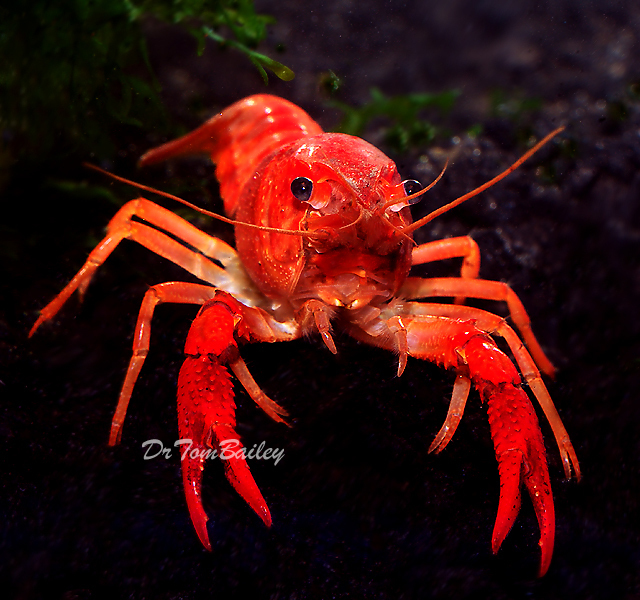 Water Conditions: This Crayfish can tolerate a wide range of water conditions. Probably a pH of about 7 with moderate hardness is best. Most water in the US seems to be OK, so it's probably best NOT to adjust the pH or the hardness of the water. Here in our facilities the water is hard and the pH is usually about 7.8. We ship them in this water. Click here for a lot more information about aquarium water conditions. Decor: These Crayfish do not need gravel, and a layer of gravel more than 1/4" thick will usually fill with bits of uneaten food that will contaminate the water. Rocks, and out of water areas would be an excellent addition for these guys. Click here for more about aquarium gravel. Life Span: This Crayfish can live for a few years. Breeding: These Crayfish have been bred in aquariums. Popularity: These freshwater Crayfish are rather popular. Variations: There are some variations throughout the US.